By Jake Rocheleau in Toolkit. Updated on July 4, 2017 . Native mobile apps always had support for push notifications. But, these notifications were absent from the web until the Notifications API popped up. These browser-based notifications are still very new and they have ways to go before catching on. Users need to allow notifications from certain websites before they will appear, so unless your audience already trusts your website, it can be tough getting people to accept. But, the best way to learn is to try and see what happens. You can send visitors links to your newest blog posts, or information about new updates to the site or even requests to sign up for your newsletter. And, with Push.js it’s crazy simple to get this working. 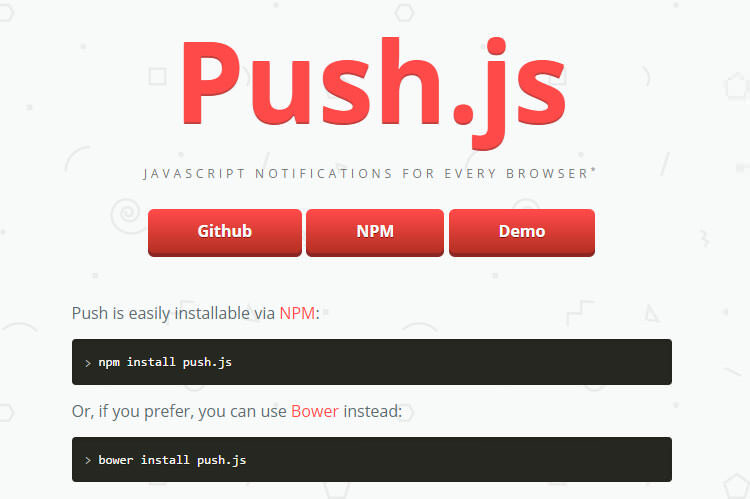 You can download the library from npm or Bower, or just grab it directly from GitHub. You can set the notification header, the main content, and other features like the auto-close time. Not everyone likes these browser notifications and this library certainly won’t be useful on every website. But, if you’re willing to give this a try it’s super easy to set up and will make push notifications a heck of a lot easier.